This is the first of two payments, read the full payment plan details below. IFM now offers a military discount! Email info@ifm.org or call 800.228.0622 for more information. By enrolling in this payment plan, you have authorized IFM to use the credit card provided to complete one remaining payment. This payment will be initiated on February 25, 2019. If your card is declined you will receive an email and phone call from IFM and be required to provide new payment information within three business days. If proper payment information is not provided, your registration will be canceled and you will receive a refund less a $300 cancellation fee. Access to pre-course information and course materials will not be granted until payment is complete. If for any reason you cannot complete your payment plan, please contact us at 800.228.0622 or email kenleeguss@ifm.org. Incomplete payment plan cancellations will be issued refunds less a $300 cancellation fee. All cancellations must be submitted in writing. Scroll down to read the full registration and cancellation policy. Applying Functional Medicine in Clinical Practice (AFMCP) synthesizes the latest medical research with a model of care that integrates each patient’s individual history, genetics, and lifestyle factors. AFMCP equips clinicians to design effective, personalized treatments for each patient. In a small-group, case-based setting, a team of experienced Functional Medicine clinicians teach participants how to use IFM’s tools to improve outcomes for patients with chronic diseases. Attendees from Applying Functional Medicine in Clinical Practice (AFMCP) discuss their experience at IFM's five-day foundation course. Access to IFM-hosted private Facebook group for community interaction. To make your reservation, book online or call 1.877.303.0104 and mention you are booking in the “IFM AFMCP 2019 March” room block. Transportation information is provided for reference only and subject to change. 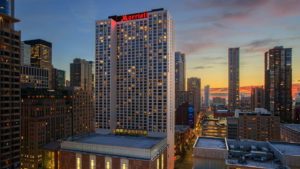 For assistance or additional questions please click here or contact the hotel directly at 312.836.0100. IFM is accredited by the Accreditation Council for Continuing Medical Education (ACCME) to provide continuing medical education for physicians. MD/DO: The Institute for Functional Medicine designates this live activity for a maximum of 34.5 AMA PRA Category 1 Credit(s)TM. Physicians should claim only the credit commensurate with the extent of their participation in the activity. The American Osteopathic Association recognizes IFM’s CME Programs for CME credits in Preventive Medicine within the American Osteopathic Board of Preventive Medicine. NEW! ABIM MOC Points Available: Successful completion of this CME activity, which includes participation in the evaluation component, enables the participant to earn up to 34.5 Medical Knowledge MOC points in the American Board of Internal Medicine’s (ABIM) Maintenance of Certification (MOC) program. Participants will earn MOC points equivalent to the amount of CME credits claimed for the activity. It is the CME activity provider’s responsibility to submit participant completion information to ACCME for the purpose of granting ABIM MOC credit. DC: Northwestern Health Sciences University (NWHSU) provides continuing education credit for chiropractic physicians. An application will be submitted to NWHSU who applies to all states, except AZ, KY, OK, NY, TN, and TX. Applications will be submitted for 34 CEU hours. For a complete list of states and approval hours, please contact IFM. ND: Generally, programs that are accredited through the ACCME for CME credits are approved by naturopathic state licensing boards. Contact your state naturopathic board to inquire if CME credits from ACCME-accredited organizations are accepted. PA: The American Academy of Physician Assistants (AAPA) accepts all continuing education credits from organizations accredited by the ACCME. Contact your state physician assistant board to inquire if CME credits from ACCME-accredited organizations are accepted. NURSING PROFESSIONAL: For the purpose of re-certification with the American Nurses Credentialing Center (ANCC) or American Association of Nurse Practitioners (AANP), hours approved through ACCME can be used. Contact your state nursing board to inquire if CME credits from ACCME-accredited organizations are accepted. RD: An application will be submitted to the Commission on Dietetic Registration (CDR) for 34.5 continuing education hours. Contact IFM for approval status. LAc: IFM is a continuing education provider (provider #0232) of the California Acupuncture Board (CAB). An application will be submitted to the CAB for 34.5 Category 1 hours. Per the Recertification Handbook of the National Certification Commission for Acupuncture and Oriental Medicine (NCCAOM), if a course is approved by a state acupuncture regulatory board, then it is eligible to submit with the re-certification application. Contact your state acupuncture board to inquire if continuing education credits approved by the CAB are accepted. Note: California acupuncturists must attend this course in full to receive CPEUs. Partial credit will not be provided. Other: Please contact your healthcare licensing board to inquire if CME credits from ACCME-accredited organizations are recognized and can be used toward fulfilling your continuing education requirements. CME credits are subject to change. Program materials and CME certificates are delivered to you through your personal IFM online account. For this reason, you may not register multiple people or someone other than yourself. Payment Plan Registration will close 4:00 pm PDT, Friday, January 25, 2019. Registration at regular tuition will close 4:00 pm PT, Friday, March 1, 2019. Late registration tuition for the regular product includes a $300 processing fee. Late registration in-person at the conference (subject to space) will incur a $300 processing fee. My registration for Applying Functional Medicine in Clinical Practice (AFMCP) signifies that I have read and agreed to IFM’s cancellation policy found above. My participation in AFMCP is not a substitute for any licensing requirements that may be applicable to me and does not independently authorize me to render care, prescribe regimens, or prescribe medications or supplements. My activities in the health and wellness field remain subject to my education, qualifications, and licensure. Cancellations must be received in writing no later than February 22, 2019, to be eligible for a refund, less a $150 cancellation fee. Cancellations received after February 22 and before March 4, 2019, are eligible for a refund less a $300 late cancellation fee. Tuition is non-transferable. Failure to appear at the program with no prior written cancellation will result in complete forfeiture of tuition and the course will not count toward certification (nonrefundable, nontransferable, no exceptions). Program materials are available only to in-person attendees. Cancellation requests must be received in writing by email or fax: kenleeguss@ifm.org or 253.661.8310. IFM will reply with a written acknowledgement. You must check in and be present in person to receive CME credit and to fulfill IFM Certification Program requirements. Only registered attendees with name badges will be allowed in the conference room. Children and unregistered spouses may not attend the program or sponsored events. In our recent study, Functional Medicine Practices: Opportunities, Challenges, and Emerging Trends, we uncovered a common need among practitioners for robust practice implementation training. In response, we’ve begun to enhance our AFMCPs and each of our Advanced Practice Modules (APMs) with additional content on translating the module into action. New presentations will explore topics ranging from clinical pearls to billing and coding compliance for insurance-based practices. The Business and Clinical Strategies for Successful Practice Implementation series is a set of 90-minute informational sessions, each of which outline the tools, laboratory testing, billing and coding, and legal considerations for implementing the Functional Medicine techniques discussed during the conference. Each session will include presentations by experts as well as a Q&A session that will allow practitioners to ask specific questions about billing, coding, and legal advice. These optional sessions will be offered in the evening of the third day of the AFMCP conference. This series is specific to the content taught at IFM. Materials, tools, and resources used will correspond to theories, therapies, treatment modalities, and considerations specific to practitioners trained in IFM’s approach to Functional Medicine. All of the lectures were brilliantly presented. They shed a new light on subjects I'd learned but never fully grasped. I feel like I learned more practical information in a week than I did in Med School.